A dog can be identified by far. It all depends on his habits and the way he acts. If a dog is lethargic and does not react much to anything or his master’s order then there is certainly something wrong with his digestive system. 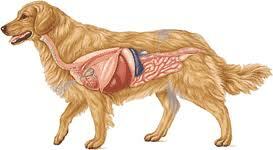 To know either a dog is going through a digestive problem you should visit a vet. If your dog is shedding or starts vomiting very often then certainly something is wrong with his digestive system or the in take of his food. Mostly German shepherds are more prone to digestive issues than others, but all dogs can suffer the consequences of a diet that produces too much stool and thereby precludes proper nutrient absorption. Both the vet and the dog breeders agree that the dogs do have a digestion problem. This problem is gain one digestion. Let’s talk about how one can find the cure to this problem. The first thing that you need to do if have a doubt that your dog is suffering through a digestion problem you should check his “Stool”. This is one of the simplest and the easiest way to make out either he is suffering from a digestion problem or not. By checking the stool either is soft or hard. If it is too hard that means he has not been able to digest food properly and if it is soft then that means he has eaten something raw or stale that has affected his digestive system. After this what you can also do is check either he has been vomiting or not. If your pup or dog has been vomiting for three or four days and you have not changed his diet then also the digestive system is said to be in great danger. Vomiting is one of the symptoms of the system being spoiled. Once your veterinarian has ruled out conditions like Pancreatitis, parasites and inflammatory bowel disease, then you can start treating him. Your dog can also pass blood in his stool. If he does so, then rush him to the vet as soon as possible so that he can be saved. We have some of are best ingredients that all the dog owners can use and provide their dog a healthy life style. Beet pulp is a good thing to have if your dog has a digestion problem as it has got a huge amount of fiber in it. Normally in digestion problems what is the most annoying thing for your dog that is that he cannot digest the food, which leads to constipation. The next ingredient on must-haves is the periodic fructooligosaccharides (FOS), which crowds out the bad bacteria. There are two kinds of bacteria one is the bad one which harms the digestive system and the other takes care of it. It makes the positive bacteria stronger to fight against the germs. The above ingredients have a lot of carbohydrates due to which it happens to be good for the digestive system. It allows your dog to absorb all types of heavy vitamin and mineral food; like fish, fish oils chicken etc. If your dog is doing all of this and is still facing all of these problems then you should ask your vet to give an “intestinal formula”. This formula will act instantly for your dig and would be better for him. You should only ask for this formula after you follow all the remedies that your vet has suggested you. After that only you should ask for this formula. It's important to note that GI tract problems are often stress-related. "Whether their favorite person is away from home or they are engaging in fun activities, like a long hike, the adrenal glands secrete cortical, which can lead to an imbalance of bacteria in the gut and can require treatment with antibiotics,” Now you should keep your dog as your first priority as this little digestive problem of his can appear to be really big and could even lead him to a sudden death. Many dog now days die of stomach cancer. It would be better if you ask your vet and strictly follow what ever he says. Once you follow his instruction with time you will find a gradual change in your dog.